Back in my youth, when I still had a stomach of steel...ish, I used to drink these really horrible energy drinks called Java Monster something or another. I liked them because they had more caffeine than coffee and they tasted like weird metallic cookies. I figured that the metallic taste was due to the fact that it contained dairy and was packaged in a can, and just rolled with it. Plus, in the summer, I used to work on the Warped Tour sometimes and they would give them out for free, and we all know free is the best flavor, right? Everything will come together soon, I promise! So, Ibotta had a rebate for a new Starbucks drink that actually comes in an unsweetened flavor, so I went for it! It was on sale, and I got a dollar back, so the thing was practically free. 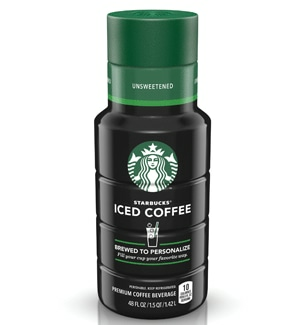 It's supposed to be iced coffee (not to be confused with cold brew, where the coffee is actually brewed cold, as opposed to being brewed hot, then cooled), with nothing in it but coffee. Unfortunately, it actually tastes very similarly to one of those Java Monster energy drinks, despite it not containing milk or sugar and it being packaged in a glass bottle. I'm not sure if I should be relieved that I wasn't somehow drinking metal particles that would eventually kill me all those summers on Warped, or if I should be more concerned that somehow it's the coffee that tastes this way on its own. It bears little resemblance to actual coffee, even actual Starbucks coffee on a bad day, which we all know is only a small step away from Kwik-E-Mart mystery coffee-like beverage. Did I drink the whole bottle? Yes, because I am a hopeless slave to the almighty caffeine. Did I enjoy it? Not at all. Do I recommend anyone else drink this? Hell no, unless you're desperate and can only afford to buy this because it's on sale and Ibotta gives you a dollar back. It has 2g of MCT - for those of you not in the know, MCT stands for medium-chain-triglycerides and is supposed to be some kind of miracle brain juice for ultimate focus and alertness...it's also the driving force behind the new "butter coffee" trend, I believe? I'm obviously only partially in-the-know, but hey, miracle brain juice! So as you can see, I was imagining some kind of yuppie goodness that would be delicious, creamy, and help me focus on work. Did that actually happen? Well, I'm technically supposed to be working right now and instead, I'm writing this review, so...you can draw your own conclusion there. Most importantly though, how did it taste?! Not so good, I'm afraid. Between the coconut cream, protein, and MCT, it didn't really mix up so well and ended up having a very weird oily, gritty texture. Call me weird, but I'm actually not a huge fan of my coffee being gritty OR oily, so...that's a big no. Texture issues aside, it still didn't taste awesome. The coconut is the strongest flavor, even more so than the coffee, which is okay, but not great. I think if it didn't feel like drinking straight coconut oil, I could probably get into it, but the texture of this one is really hard to get past. I might not even make it through the whole bottle, and you know that's saying a lot coming from me!